Who do you want to leave this world as, what impression do you want to make with your energy in this life experience? There is a unique humanitarian in each of us, a part of our Soul that calls us to be of service in some way. With catastrophes happening constantly all around the world, you might be feeling more helpless than ever. Waking up in the morning, the first thing on your mind might be to ask in prayer, ‘how can I help’? There is something all of us can do to contribute positively to this earth, each of us has something to give. Big or small it makes no difference, not if we are making an encouraging change in some useful way. It starts with your attitude, a constructive intention to want to do something beneficial and helpful. It might mean thinking outside of the box, letting go of attachment to old conditioned thought patterns. It might mean convincing yourself that one small act of kindness, whatever the case may be, can and will help to raise the vibrational energy of this planet. What is it you can do today to help uplift this quivering and unstable earth, what impact can you contribute that will bring a smile not only to your face, but the face of someone else? Maybe it just starts with a grin. Have you noticed yourself and how you feel when you are smiling, everything inside of your physical body gets a blast of happy juice when you smile, what a great way to send out a vibration of love into the world, a smile doesn’t cost a cent and it is within your power and free will, to smile as much as you want. I challenge you today, to do something within your capacity to help strengthen this planet, you are mightier than you think and your potential as a humanitarian is boundless. 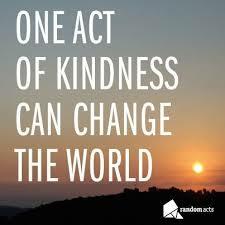 One small act of kindness a day, if each of us contributed in this way, what a world we could have.